Former Bosnian Serb leader Radovan Karadzic has refused to enter a plea to charges of war crimes at the United Nations tribunal in The Hague. A tribunal judge entered a plea of not guilty to all charges on his behalf, in line with the rules of the court. Mr Karadzic faces 11 counts, including genocide, relating to the 1990s Bosnian civil war. He was arrested in the Serbian capital Belgrade in July after 13 years on the run, living under a false name. Facing the tribunal for the second time since his arrest, and looking calm and composed, Mr Karadzic said it was a "court of Nato" which had as its aim his "liquidation". "I've stopped using a false name so I think that all parties should do the same," he said. The charges against Mr Karadzic include what is regarded as Europe's worst massacre since World War II - the killing of up to 8,000 men and youths in the enclave of Srebrenica. There will be a further hearing on 17 September. No trial date has been set. Judge Iain Bonomy entered the plea of not guilty after the defendant declined to hear all the charges against him individually. "As to count one of the indictment," the judge had begun. "You're charged with genocide... How do you plead, guilty or not guilty?" 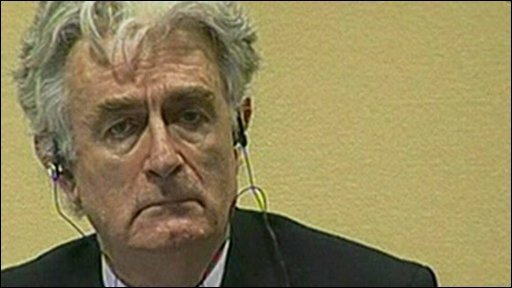 "I will not plead, in line with my standpoint as regards this court," Mr Karadzic replied. "I shall therefore enter a plea on your behalf of not guilty," the judge said. "Is that the position you're going to take in relation to each of the other 10 charges on the indictment?" "Absolutely, yes," Mr Karadzic confirmed. As Judge Bonomy entered the not guilty pleas, the former Bosnian Serb leader asked: "May I hold you to your word?" "Which word?" asked the judge. "That I'm not guilty," replied Mr Karadzic. "We shall see in due course, Mr Karadzic," the judge said. Friday's hearing also saw some friction between the judge and prosecutor Alan Tieger over work on drafting a streamlined version of the indictment. When Mr Tieger said he hoped to have a new charge sheet ready by the end of September, Judge Bonomy snapped: "I sincerely hope you are not serious about that date." The indictment includes genocide, crimes against humanity and war crimes. The alleged crimes include Mr Karadzic's involvement in an attempt to destroy in whole or in part the Bosnian Muslim (Bosniak) and Bosnian Croat ethnic groups. 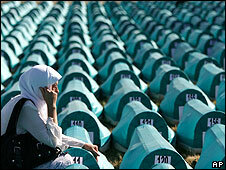 That included the killings at Srebrenica and the shelling of Sarajevo, killing and terrorising the city's civilians. The indictment says Mr Karadzic knew about the crimes that were being committed by Bosnian Serb forces, but failed to take action to prevent them. Since his first appearance before the court 30 days ago, Mr Karadzic has filed several motions including one contesting the appointment of presiding Dutch judge Alphons Orie, who he claims is biased against him. Mr Karadzic argues that the trial against him is illegal because under the terms of a deal made with former US peace envoy Richard Holbrooke, he was offered immunity from prosecution. The claims have been ridiculed by Mr Holbrooke.